Golf & Blues Great Escape! 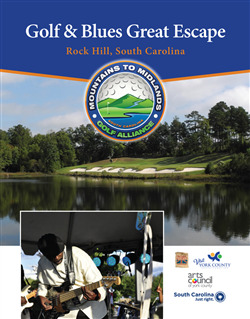 The Mountains to Midlands Golf Alliance is featuring The Golf & Blues Great Escape in Rock Hill, South Carolina, October 1 -5, 2019. The Piedmont region of the state, 20 minutes south of Charlotte International Airport, is the home to some of the most historic sites of not only South Carolina but the United States. Golf, exceptional food and meeting new friends; that’s what awaits you at the Great Escape. Friday participants are escorted to the Blues and Jazz Festival Restaurant Crawl; 7 venues in Old Town Rock Hill - See 7 different acts. Net price to IAGTO members is $719 per person based on double occupancy. Enjoy 4 nights, 3 rounds, breakfast each morning, reception, gift basket, dinners Wednesday and Thursday, Friday Cocktail party and departing lunch on Saturday. Arts Council of York County Jazz and Blues Festival- Thursday and Friday nights.